Control exactly how much effect you want in your mix. With the original "Mosquite Blender," there was only a knob available to control the amount of saturation. With the Expressio, you can connect an expression pedal to have full hands free control of your desired saturation. Evidently, this blender still works without an expression pedal. The Mosquite Blender Expressio was a direct result of customer feedback. People wanted to be able blend in effects gradually or just be able to have different amounts of saturation throughout a live performance. 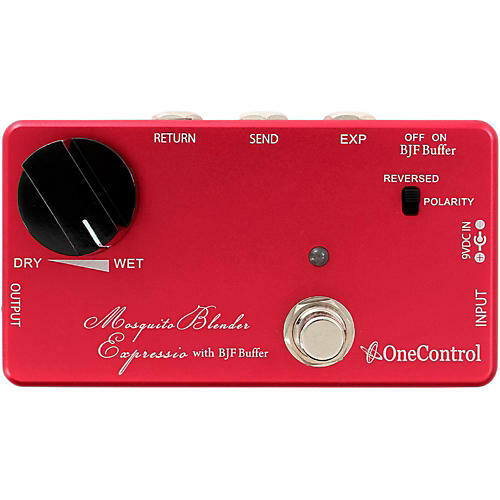 An expression pedal input was the best solution. Additionally, a selectable BJF Buffer was installed to add even more versatility to this pedal. Just like the standard Mosquite Blender, the Expressio version can be used with an effects loop on most amplifiers. Since you have the ability to control the amount of saturation, this is a great tool for fine-tuning your amp's tone during soundcheck or recording sessions.